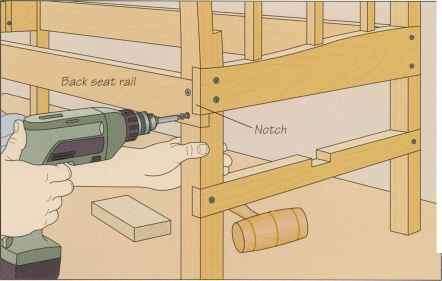 Start by attaching the front seat rail to the front legs, using a mallet and wood block to tap the half-laps together, and glue and screws to fix the pieces. 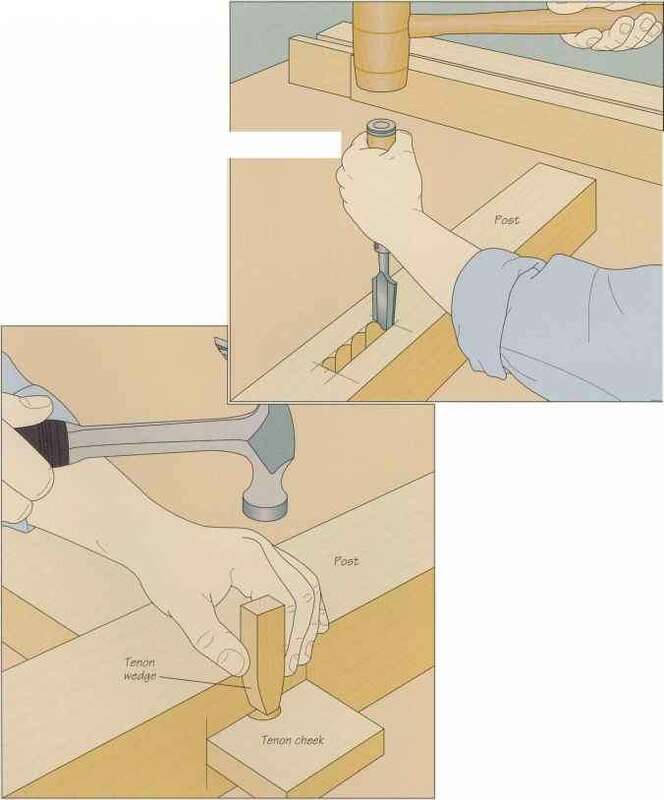 For the back rail, set the assembly upright on a work surface, position the board against the rear legs, and mark the position of the notch that must be cut in the end to enable the outside face of the rail to sit flush with the back edges of the legs. Cut the notch, then glue and screw the rail to the legs (right). 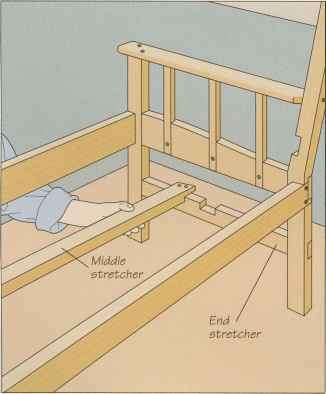 Cut a rabbet at each end of the stretcher to mate with the dadoes in the end stretchers. Drill two clearance holes through the stretcher at each end of the board, then spread some glue in the rabbets, set the piece in position (above) and screw it down. To make the bench more comfortable, round over the top edge of the front seat rail. Install a piloted rounding-over bit in a router and set the depth of cut to reach your final depth in two passes. Make the first pass along the inside face of the rail. Butting the router base plate against one front leg and holding the tool level on the rail, feed the bit into the stock and along the rail (above)-, make sure the bit's pilot bearing is pressed against the stock throughout. 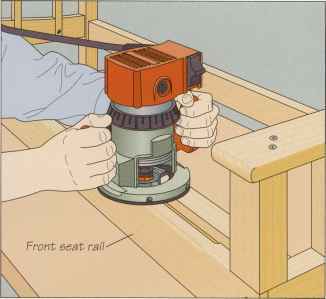 Stop the cut when the router contacts the opposite front leg, then repeat the pass along the rail's front face. Increase the cutting depth and make two more passes.